On June 27th, Ewbank’s will sell The Michael Compton Collection of Post War & Contemporary Art, which consists of 28 works by luminaries Roy Lichtenstein, Marcel Broodthaers, Henry Moore and many more. Most of the pieces were given in thanks by the artists or their families to Compton who careers were enhanced by the exhibitions he created. The collection- which also includes Terry Frost and Richard Long- is expected to raise around £200,000. Michael Compton was born in Somerset and spent his early childhood in India and was educated in England and South Africa. He studied Art History at The Courtauld Institute. Compton worked at Leeds Gallery, The Walker Art Gallery of Liverpool and The Ferens Art Gallery in Hull for which he acquired the first David Hockney to enter the museum. He retired from The Tate in 1987. In recognition for connecting British art to Contemporary Art in Europe and the U.S, he was awarded a C.B.E. A small Lichtenstein bronze entitled: Yellow Brushstroke, was presented to Compton by the Frederick R. Weisman Art Foundation at an awards event held at The Los Angeles Museum of Contemporary Art on May 23rd,1991. The presentation was in recognition of his work as curator of the 1989 Marcel Broodthaers exhibition at The Walker Art Center in Minneapolis. The piece is number 11 of 19 for an initial lifetime casting and is estimated to fetch £40,000-60,000. Lichtenstein said of this work it was ‘’just an idea to start with, and painting it makes it more concrete, but when you do it in a bronze sculpture, it becomes real and has weight and is absurd, contradictory and funny.’’ Broodthaers died in 1976. In 1980 Compton curated the first retrospective of the Belgian artist’s work which was exhibited at The Tate. He went on to curate the 1989 exhibition in Minneapolis which also travelled to The Museum of Contemporary Art in L.A and the Carnegie Museum of Art in Pittsburgh. The artist spent 20 years in poverty as a struggling poet before turning to art in 1963. 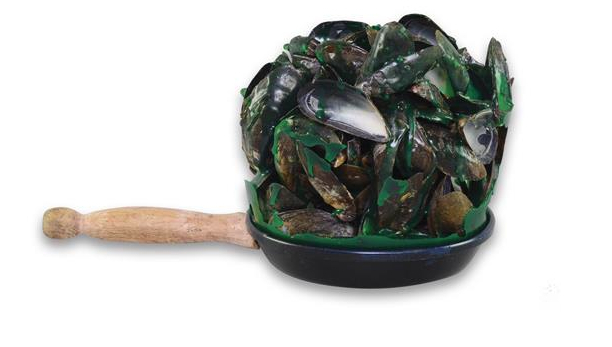 Arguably one of his most famous surreal works Poele De Moules, which depicts mussel shells in a frying pan, is a witty nod to his homeland of Belgium’s native dish. Associated with the Belgian Groupe Surrealiste-revolutionnaire, he made use of found objects and collage. Poele De Moules is expected to reach between £40,000-60,000. Sir Henry Moore gifted two inscribed lithographs to Compton as thanks for organizing the 1977 Henry Moore Drawings Exhibition as The Tate which will be up for auction. Also featured in the sale will be a signed wine bottle given to Compton during the dinner for Henry Moore at Café Royale. Works by Victor Newsome, Keith Milow, Billy Al Bengston, Ian Stephenson, Sol LeWitt and Joe Tilson will also be included.